the extra 10 | escaped. I'm seriously not a kid person. So when I got married and got an extra 10 nieces and nephews by default from Shahrul's side, I got very scared. Still, I think I'm lucky that he's a farr more kid person compared to me (his nieces and nephews actually call his name around the house and ask him to bring them around every single day and hang off his body almost all the time, I kid you not) but at the same time I'm really lucky too because he never force me to do anything similar. Because whenever the kids are around me, usually all they'd be getting is silent treatment. Awkward stare. Actually they call me Maksu Zatil, but one of them got confused and ended up calling me Mak Zatil. "Maksu, kenapa nama Maksu Zatil?" "Maksu, kenapa Maksu kahwin dengan Paksu?" "Maksu, jom lah main dekat luar"
I thought it was just too rude to just smile, but I'm really really clueless on how to interact with kids. So after observing how Shahrul handled the kids (after a few days), I started to loosen up a bit. Approached one of his nieces, who's around 3-years old. "Hai Amni! Amni tengah buat apa tu?" I should just give up, shouldn't I? But some of his nieces who are older, I find them more approachable. The eldest one is by far the friendliest; always looking out for me whenever the little ones are pulling down my top or poking me around for fun. Last few days, we went to his brother's house to pick up the rest of his stuff. While I helped Shahrul packing the stuff, his nieces were around assisting us and entertaining us with their stories. Now that I've loosen up a bit, I kind of get why people want to get more kids. They're so bubbly, for a start; and sometimes when you listen to their stories - they aren't so bad! Of course there would be tantrums and fights, but after a few minutes they would somehow make up and return to their normal self again. 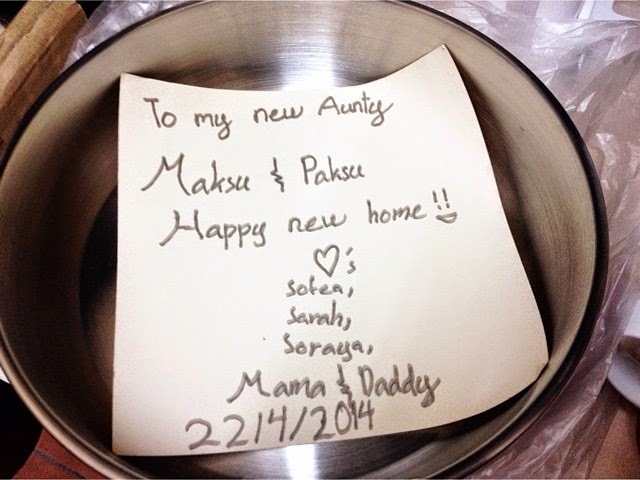 Before we went home, the kids gave us our "new home present". Ooh did I mention he has 10 nieces and nephews? haha you are funny ok! Keep on blogging!! Haha usually I TRY to be funny because I'm not, in general XD But thank youu!